The Bible Memory App is also the only Bible memory system you can access across all mobile devices & online, at BibleMemory.com. Your progress stays in sync between all of your devices, so you can memorize anytime, anywhere. Even without the Internet! MEMORIZE Bible verses fast by actively engaging 3 separate cognitive areas: kinesthetic (touch), visual, and auditory memory. • Visual: Draw Pictures & use Flash Cards (*PRO features). Animated Word Emphasis feature accentuates each word to ingrain it into your memory. Create & ORGANIZE your personal Verse Library. • Import verses from ANY of the following 10+ translations from the Internet: Amplified, ESV, HCSB, KJV, NKJV, NASB, NIV, NIV84, NLT, The Message, & in Spanish with Reina-Valera 1960. • Enter verses manually in ANY version. • Choose Bible verses by topic from 57 verse collections in our Verse Library. 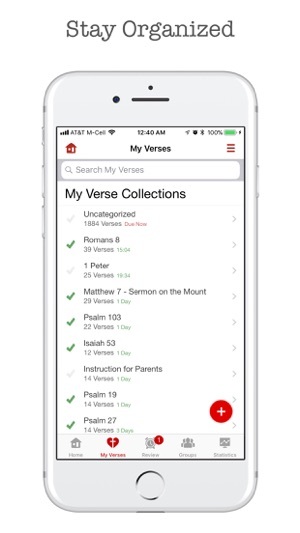 • Create & name your own verse collections with verses you choose yourself. 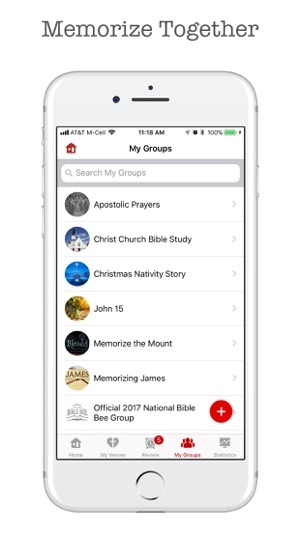 • Join one of over 9,000 Bible memory groups to memorize verses together. • Start your own Bible memory group. It’s easy to invite others via text message, email, Facebook, & Twitter. Never forget another verse with our SMART REVIEW SYSTEM. • Our Smart Review System reminds you to review your verses on an automated schedule. • You can also customize your review schedule for any verse to review it on your own schedule (*PRO feature). • Receive optional emails &/or mobile Review Notifications to review verses at the time of your choice. • Read the Bible & memorize verses, all in one app! 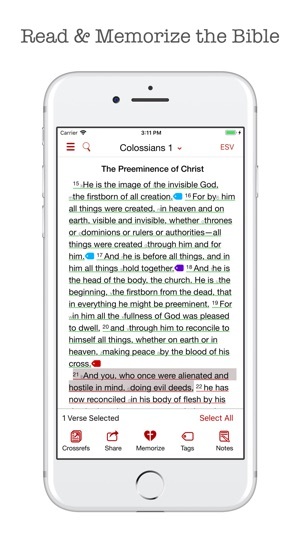 • See your memory verses underlined and color coded by review status in the Bible. • Search for keywords across multiple translations (*includes all purchased translations). • Inline cross-reference links make it easy to explore related passages (ESV, CSB & NASB). 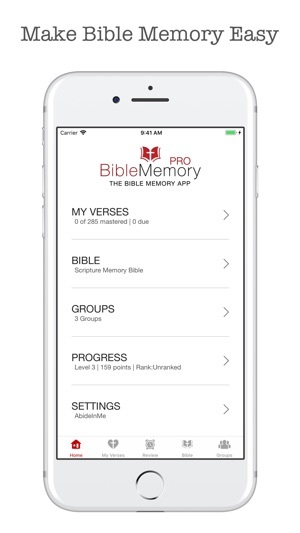 • The Bible Memory App will guide you through the 3-step memorization process, Type It—Memorize It—Master It. • Once a verse is memorized, you can easily review it by typing, using Flash Cards (*PRO), or with Audio playback (*PRO). • Type without looking. Modified key zones give you credit for hitting any key adjacent to the correct letter. • Heat Maps automatically highlight trouble spots in your verses (*PRO feature). • Earn Badges & Advance in Rank with other members. 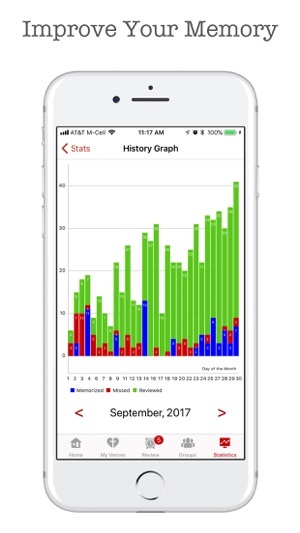 • Track Your Progress with history charts (*PRO feature). • Easily share verses with friends via text message, email, Facebook, & Twitter. • Multi-User & Family Friendly. Easily use multiple accounts on the same device. • Record yourself reading your verses. • Play back verses individually or by collection in a continuous loop. • Review hands-free, anytime, anywhere! • Select background music from your device & independently adjust the volume. • Turn off your screen & your recordings can continue to play. • Recordings sync between all of your mobile devices. • TIP: Speak along with your recordings for an extra retention boost. Engage your senses. Succeed at Bible memory with The Bible Memory App today! 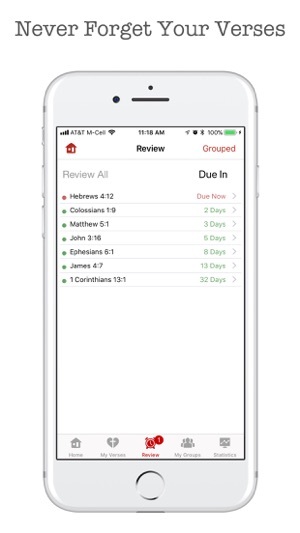 *Bible Memory PRO is available as an in-app purchase. *Scripture Memory Bible is available as an in-app purchase. Nothing is required on your part. Everything else about the app will remain in place, including all of your in app purchases. This change is part of a larger effort to help more people engage with God's Word by memorizing Scripture. Please join us in sharing the news and spreading a love for God's Word! I was looking for something to help me with scripture memory but am amazed at the thought and expertise put into this app. I very much appreciate the variety of choices that you can use to help in memorization. You can record your own voice and listen back to the Scriptures. You can play background music , You can turn on or off alerts when you type a wrong word. You can also use flashcards. You can set up your versus according to a topic. You can lock them to review for certain number of days, or they progress longer between each review if he would prefer that as well. You can also set a percentage of accuracy as to when it tells you you must do the verse again. This is one of the apps that I have probably had on my phone the longest, and I use it daily. I do not easily memorize, and I appreciate the way this helps me to hide God's word in my heart. Whenever I have had a question I received an email response back within a day, so customer support is excellent. I love the latest update! I was unable to figure out before this newest update how to play music in the background and not have a too loud for me to hear the recording. Perhaps that option was available but I couldn't figure it out. I love that you can play the background music quietly and hear the recording of the verses more clearly. Thank you. It takes me back to my school days, when background Music seem to help with memorization and concentration. I have tried several different apps for scripture memory and this is by far the best. I have memorized over 500 verses in less than 2 years. I almost never miss a day. I really appreciate that when I get a word wrong, my phone vibrates and the correct word goes right in. On the other app I was using I had to keep guessing until I got it right. I also appreciate that the place where I got the word wrong stays shaded in for a few reviews to help me remember. I appreciate that the app gives grace for typos. The other app didn't and I would be so tense during review, worried about not hitting the key exactly. It became more about finger placement and less about learning verses. The other app made me feel like I was always being tested. This one makes me feel like I'm being instructed. Huge difference. I LOVE the review schedule. Every morning I wake up and my verses for the day are waiting. As I master them and recall them accurately, they are scheduled for review less and less frequently. That way I can concentrate on the ones I am learning. update: still love it but lately my longer passages (whole chapters) have started disappearing during review. The page goes blank and I have to start over. So I contacted support and they fixed it with their next update. These guys are amazing. And they added a lock button. I love the lock button!! This is truly an excellent app! I have always loved the idea of being able to rattle off Bible verses from memory and apply them to various situations in life. I had seen others do it and admired them for their memory. Memory verses get stuck in my head as pictures or concepts but I had trouble recalling the precise wording. Partly due to exposure from different translations. I decided to try using this app to memorize 14 verses from the book of Romans to help in presenting the gospel. It ended up being so easy and fun with this app that I set my sights on memorizing a collection of 100 verses that were put together for witnessing to Mormons. Those were going so well that I threw in some more verses along the way. I am now up to 63 verses. Not only can I recite them precisely I can do it with the reference and can even do it in random order. I look forward to finishing off the rest in my list (130 in all) and then I plan on adding some more! This has helped encourage me to have very regular daily devotions memorizing the Word and learning the context of the verses. I don't typically write reviews and I am not very good at remembering details but this app is worth a 5 star review and has helped even a guy like me memorize scripture. Give it a try!! !